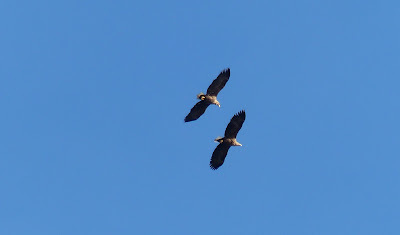 Last week in a twenty minute walk to the top of the road above my house, "Raptor" the village's other wildlife photographer watched a pair of sea eagles, a pair of golden eagles ,two buzzards and a female hen harrier. It seems that Ormsaigbeg is rapidly becoming Lochaber's top eagle watching site. The sea eagles ( cousins of the American bald eagle) are hard to miss as they are Europe's biggest eagle and fourth largest in the world. They were soaring and diving but not yet doing their aerial mating display, diving to earth with locked talons. Golden eagles do spectacular aerial display too, diving, dropping sticks and then catching them but it's a bit early for that as egg laying for both species starts around the end of March. This pair bred here in 2017, their wing tags were clearly visible. There has been a female hen harrier and a male around for some time and as we don't have grouse moors here our population is free from persecution and hopefully they will breed in 2018. I didn't see any of this as I am in Northumberland house sitting for friends but I was once told that Northumberland has the greatest bird diversity of any county in England because of it's diverse landscapes, the coast and the Farne Islands. In one day this week I listed 21 species in, around or flying over the garden. To verify this claim that Northumberland has the greatest diversity of breeding bird species I would have to trawl through the list for every county. I will leave it to you and then you can add a comment!